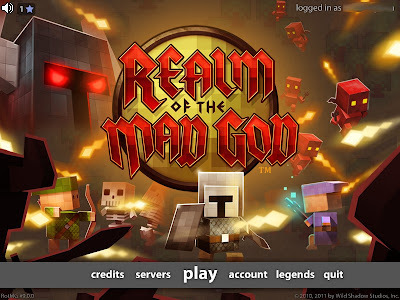 This game is currently free to play on Steam. You can also play here: http://www.realmofthemadgod.com/. You can also register your Steam account as a web account to play on the website or use your web account in Steam. When you load the game in Steam, just hit the "account" button and choose which option you want. I'm the blue wizard and to my right is Josh's grave. At the bottom right, he tells me via Steam chat, "that was hectic." The art is like old-school graphics. Very simple, but aesthetically pleasing. Or I suppose it's more nostalgic. In any case, you play a character class and move around attacking mobs on a gigantic world map. As you fight, you gain items and experience. Unfortunately, if you die, it's over, so it's important not to overextend. 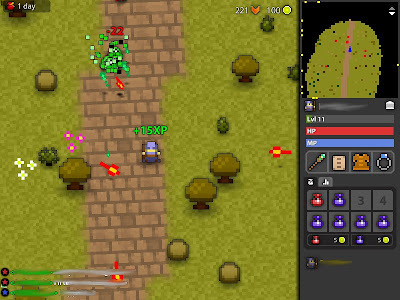 The game boasts being able to support a bunch of players in the same world at the same time. This certainly holds true in the lobby, and with the simplicity of the graphics, I don't see why not. At one point, another player and I traveled the map together to fight baddies. But we overextended and he/she died. I don't remember if that was the first game I started or the second game. I didn't lose the second game yet. 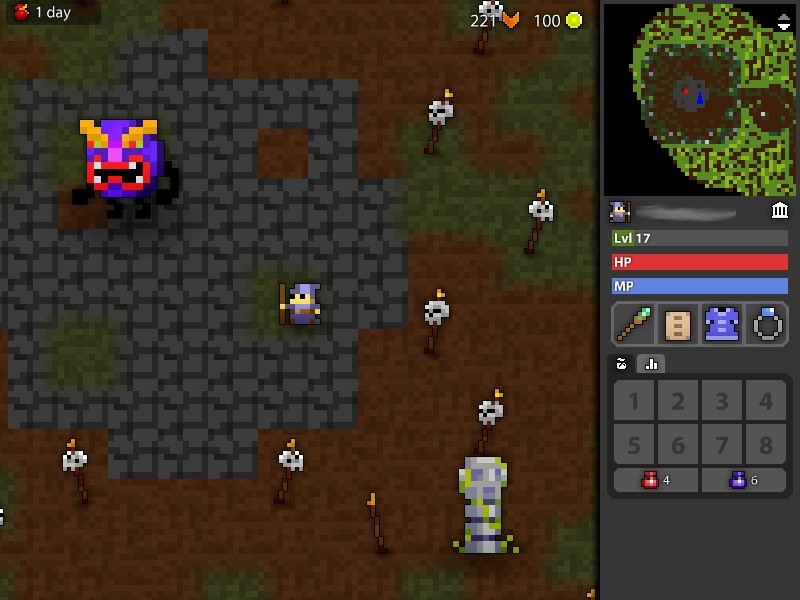 I suppose to play it safe, you can level up with the easier mobs before exploring more of the map. Some enemies can really deal damage. So maybe traveling in groups wouldn't be a bad idea, but you should probably get a good diversity. I only know about the wizard class, but as I tried to gather equipment, I noticed other standard classes such as necromancer, priest, ranger, and warrior (or maybe knight). I believe classes need to be unlocked as you level a different class. I don't know the specifics. I didn't play too much. Though I definitely played enough to say the game has some addictive qualities. Also, not all is loss if you die. I believe you still gain experience for the class. And like I said, you at least unlock other classes. I'm not sure what else. Killing a snake. 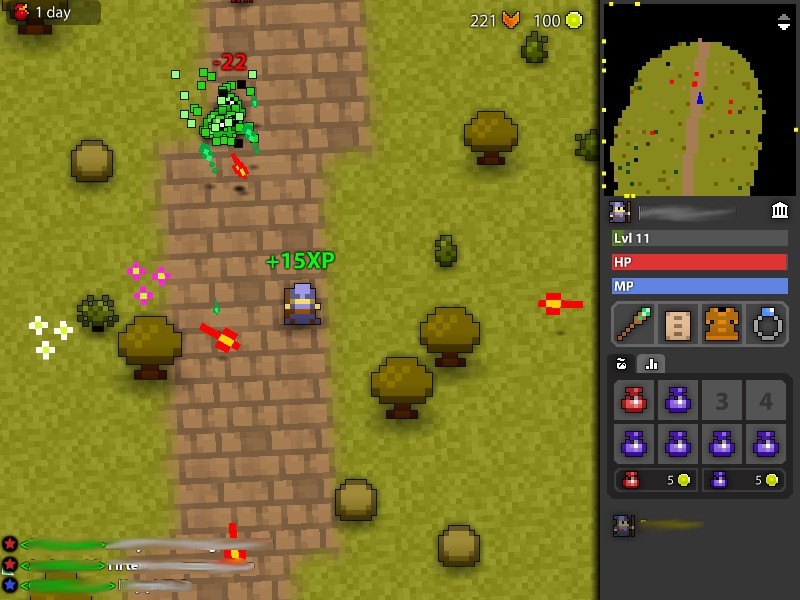 Mobs are also shooting at me from off the screen. 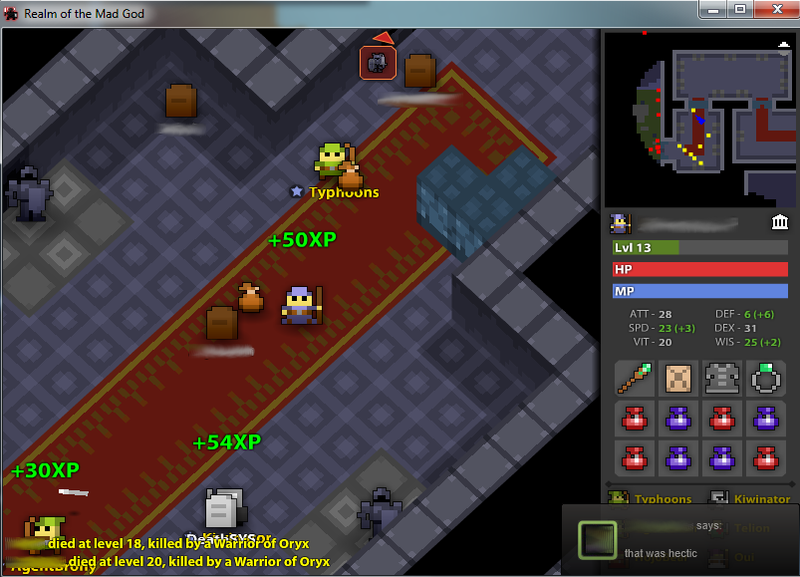 So I when I died as a level 12 Wizard, I had earned 39 Fame. My current Wizard is level 11 and has 10 Fame. I have no idea about the purpose of Fame, but you get it by accomplishing class quests. I also at some point unlocked the Priest class. I believe the rate of attack for holding down the mouse button is faster or just as fast as rapidly clicking down the mouse. Kiting seems like a safe strategy. Picking off the enemies that venture out towards you. However, this might be inefficient compared to the spawn rate unless you either have all day to spend or travel in a group. Also, I don't know if there are restrictions on going back to the Nexus (the lobby), but that seems like good alternative to dying. You lose any uncovered map, but no big deal. Steam has me logged for a total of 11 hours and that I last played on 20120625. I tried to kill this guy, but couldn't and had to teleport away. I played some more today, but mainly just to get some screenshots. This game is free-to-play, but the fun doesn't last if you don't put money into it. And the amount of money that you would have to put into it to make it fun isn't worth it. For example, you are given, free of charge, one chest with 8 slots to stash equipment. That equipment stays in the chest even when you die and start a new character. 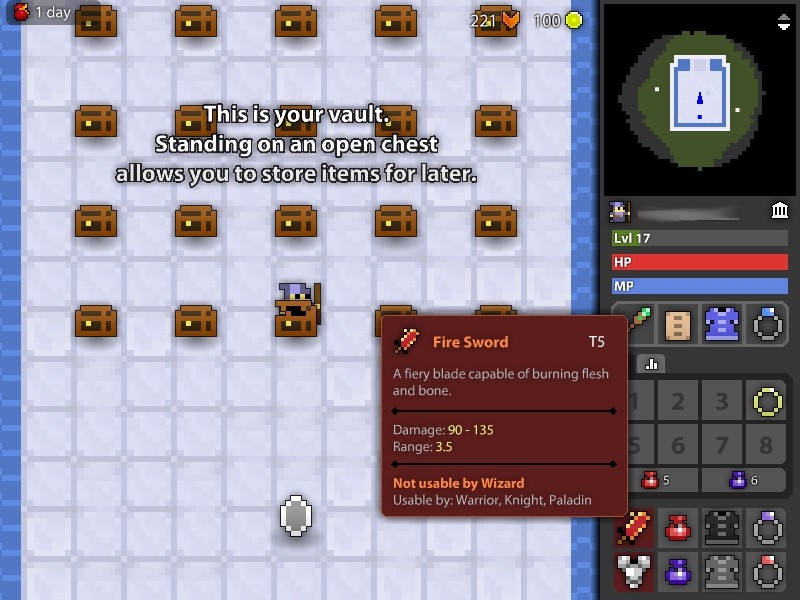 Teasingly, the vault is full of many chests, but they need to be unlocked. For every chest you want to unlock, you need to pay between 3 and 5 dollars (depending on which real money for in-game gold package you purchase). That's ridiculous. There's plenty of games out there that are hours of fun for the fraction of the price. For example, I bought four copies of Terraria (2011) for $7.49 and I've logged 130.9 hours on it! I have given out two of the copies, one friend has logged 5.2 hours and another has logged 191.0 hours!